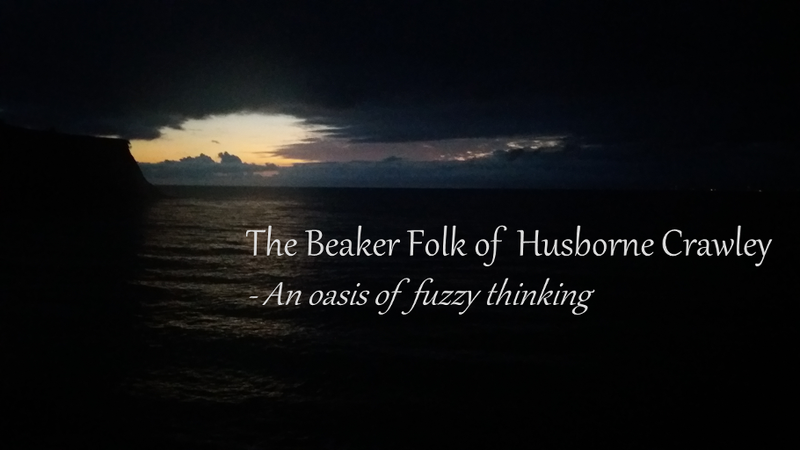 Beaker Folk of Husborne Crawley: Can a Christian Be Friends with Atheists? Brothers and Sisters, it has been a while since I last wrote to you. The soi-disant "Archdruid" across the Park has cut off my access to the Internet. Albeit I was not totally disappointed. I believe that Marjorie may have been watching Frankie Boyle performances on Netflix again. And she says it always makes her so disappointed in me. But Eileen is away preparing her exorcism service for the coffee filter machine. And therefore I have been able to access the blogging machine for a short period of time. I hear what you are already thinking. What a ridiculous question. Irresponsible, some would say. Clearly the answer is "no". How could one risk even talking to them in a context without strict delimiters between the sacred and profane? Who would take such a risk? The correct question should surely be: how do we ensure that we are yoked under no circumstances with unbelievers, while simultaneously letting them realise what they are missing in friendship with ourselves and, of course, Christ? The answer is to be friend-ly, while making it quite clear that only when they are like us will they be allowed to be friend-s. I normally hand them one of these cards to ensure that would-be-friendly unbelievers know where the boundaries have been drawn. This helps to bring any undesired pleasantries to an end: I hope they go off to reflect on how far they have fallen. It may be best if I show some examples of dealing with over-friendly atheists and other devilish surrogates through the medium of role-play scenarios. I recommend you try these out in your youth or Bible study groups, or ministerial training college, in case you unexpectedly fall among atheists or, worse, Anglicans. Passing Atheist: That's a lovely dog. What's his name? Godly Christian: Belteshazzar. And what is your dog's name? Godly Christian: That is not a Biblical name. Do I presume you are an atheist? Godly Christian: No more! Read this leaflet, "The Cries of the Damned." And when you are ready to repent, come back to see me and then we can see about taking our dogs for "walkies" together. Godless Boss: That's me just about done in. Look, you've all worked really hard today. Let's go down the pub and I'll get you all a drink. 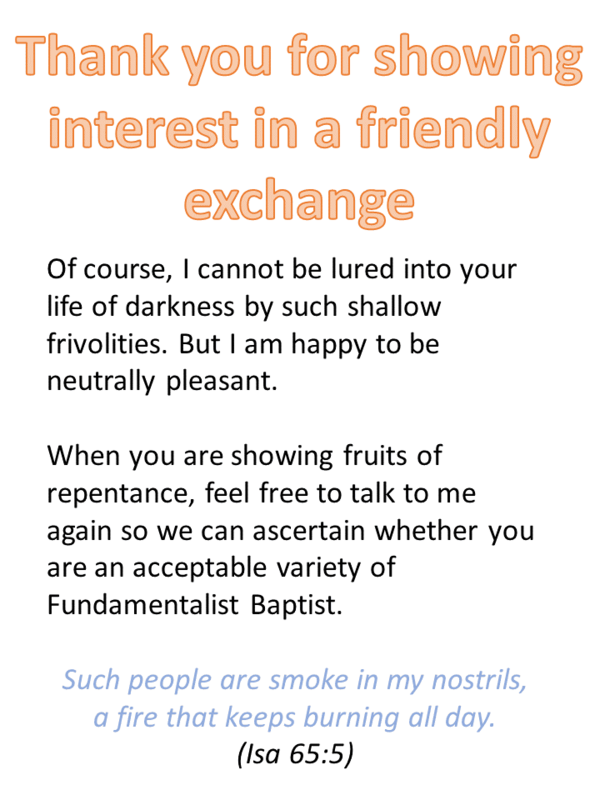 Godly Christian: I am afraid that I will not be able to accept your offer, leading as it inevitably will to sin and the gates of Hell. Godless Boss: OK, you're busy then, Godly? 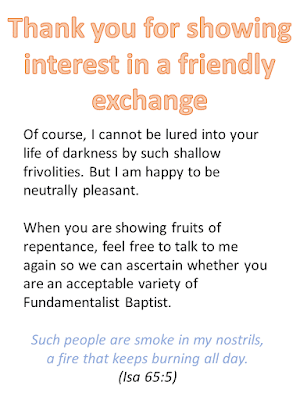 Godly Christian: Were I a lying heathen such as yourself - no offence - then I would reply in the affirmative. But as I am a Godly Christian and therefore a speaker of truth, I must instead inform you that I have no activities apart from some praying and sitting quietly planned. But I will not be inveigled into this place of alcoholic temptation with you and your spawn of the Dark One, otherwise known as Accounts Payable. Godless Boss: Maybe another day then? Godly Christian: There may not be another day. How do you not know this is your last? Flee from your foul bibbing and REPENT! Till-Operating Jezebel: That'll be £23.45, please. Godly Christian: Here you are. Please be aware that, in passing you these coins, I am merely rendering to Asda what belongs to Asda. Till-Operating Jezebel: Would you like change? Godly Christian: Know that we will all be changed! At the last trumpet! But unless you change your heart, then the laser in this till will not be the only red light you will be dealing with - for all eternity! Till-Operating Jezebel: That will be 5p back then. Godly Football Supporter: You're going to Hell in the Devil's Ambulance! Manchester United Supporter: Here, are you in the wrong end, mate? Godly Football Supporter: I hope that is not a reference to the Sin That Dare Not Speak Its Name. Begone, foul minion with your true "Special One" depicted on your club badge. Manchester United Supporter: OK lads, we've got a right one here. Godly Football Supporter: Know then that I am happy to suffer blows and be persecuted for righteousness' sake. But please stop throwing pies at me. I wouldn't be friends with some Atheists I know..
Have you noticed that the link to the article in CT now simply goes to the CT home page? The article itself appears to have vanished - but not before I directed a good number of the Pesky Methodists (https://www.facebook.com/groups/1833957343528340/) to view it. So I can provide plenty of witnesses that it did really exist adn said the things it said. Presumably, even within CT there are a few sane people who realised what nonsense they were spouting! PS. If the Archdruid would like to join the Pesky Methodists, she will be most welcome. While peskiness is a requirement for membership, being a Methodist is not! I was for many years a member of the Extremely Primitive Methodists. A faithful bunch but much inclined to hypothermia. PPPS _ Thanks Judy now linked to the Google Cache. Google is like unto a Recording Angel. And not a friendly one. Not sure that you can identify an Atheist in any real way these days. Clones of that famous Atheist (I forgot his name) are not distinguishable in any way from the rest of us - they don't wear a God Collar for instance, nor do they brandish an upside down Crucifix. So we should endevour to befriend these lonely souls, as their only friends are each other, with nothing to look forward too. New Atheists on the other hand should be shunned, as they're probably secret Christian Spies, trolling atheists to convert them - and they will than unfriend them and move onto their next victim. I was approached by a strangely dressed new wAtheist as I wandered through the Library at a Cambridge College, they asked me did I believe in Nilhism or some such thing, than surprised me by saying that all old atheists were secretly Christians, hedging their bets, while New Atheists were true to nothing at all. I was sure that this was a ploy to find out whether I was a Christian Mature Student, but their ploy failed as I pointed out that I was a Retired General and I only believed in the Glorious Death of a soldier - all of a sudden he turned out to be a pacifist and offered to punch me on the nose. Tue Colours revealed. I have met atheists who were considerably preferable to some Christians I have met.